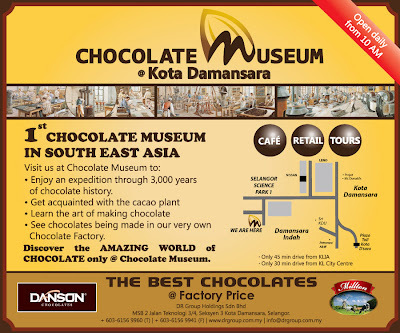 KUALA LUMPUR, Dec 5 – The Chocolate Museum at Kota Damansara, which is the first chocolate museum in Southeast Asia, is now open to the public, DR Group Holdings Sdn Bhd assistant general manager, Mohd Khairudin Abdul Jalil, said today. Entrance to the museum, which opens from 9am to 5pm from Monday to Saturday, is free. He said the museum was set up to educate the people on the history of chocolate and its health benefits. There will also be demonstrations on chocolate making and visitors also get to buy chocolates at factory price, he told reporters here today. Mcm menarik jg tempat ni..boleh lah masukkan dlm senarai lawatan ni..t.kasih share ita..
kami pun nak masuk list minggu depan ni..